Recent ECC presenters Emilie Baltz and Jason Wright are organizing this event, and other recent presenters Brian Sullivan and Mihir Desai are participating. Tasteologie and Droog design present CMYK Cocktail, a private evening of tasting color in multiple mediums to benefit the Food Bank of New York. 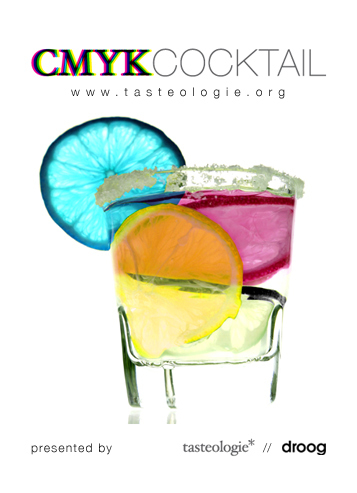 5 mixologists and 5 renowned designers will each present their interpretations of the CMYK graphic design color standard (Cyan, Magenta, Yellow, Black and White) through 5 courses of unique cocktails with paired tasting plates, complimented by presentations from each designer. CMYK Cocktail will bring together mixologists Orson Salicetti of Apothéke, Mayur Subbarao of Dram Bar, Tomas Delos Reyes, Brian Sullivan of MethodLabDesign, and Mihir Desai and surprise guests to present five tasting courses specially conceived for each of the CMYK colors accompanied by a unique signature cocktail. Before each tasting, four acclaimed designers including conceptual designer Tobias Wong and curator Josee LePage; Joshua Walton and James Tichenor of the Interaction Lab at Rockwell Group; interaction designer Renda Morton; and renowned illustrator and graphic designer Seymour Chwast will “toast” one of the four CMYK colors, presenting their importance in shaping how and what we consume. An open bar will follow the event. Guests will receive a limited edition, hand-screened CMYK gift bag with ticket purchase. Ticket quantities are limited to the first 50 guests and include 5 cocktails, 5 tasting courses, designer presentations, limited edition gift bag and open bar. Visit Tasteologie.org for tickets and more information.